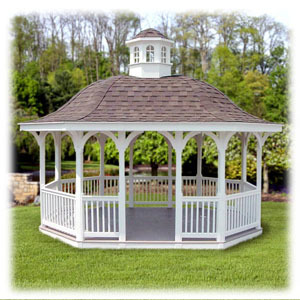 We use a special treated lumber to resist insects and decay while keeping the safety of children and pets foremost in mind. 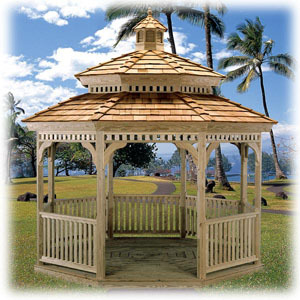 Carpentry is an art and a skill. So we take old-world craftsmanship and dedication, and add the most modern computer-numeric-controlled (CNC) milling and forming equipment. 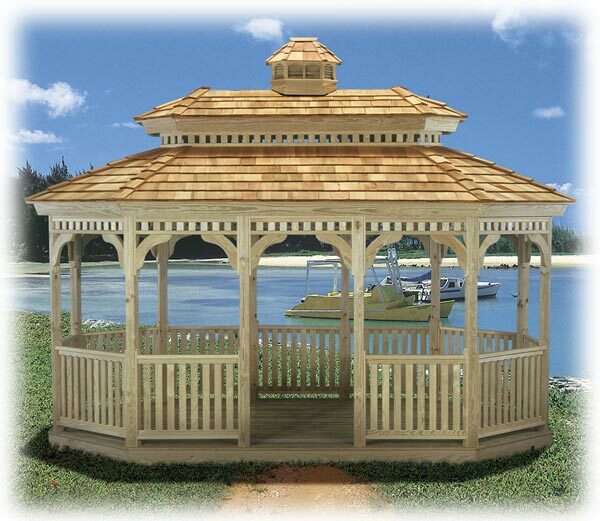 The result is a pre-built product that has precision fits, tight joints, and the attention to detail that provides extra years of enjoyment for you. New-generation treated wood used on all of our wood gazebos is safe for children and pets, and the whole neighborhood as a matter of fact! 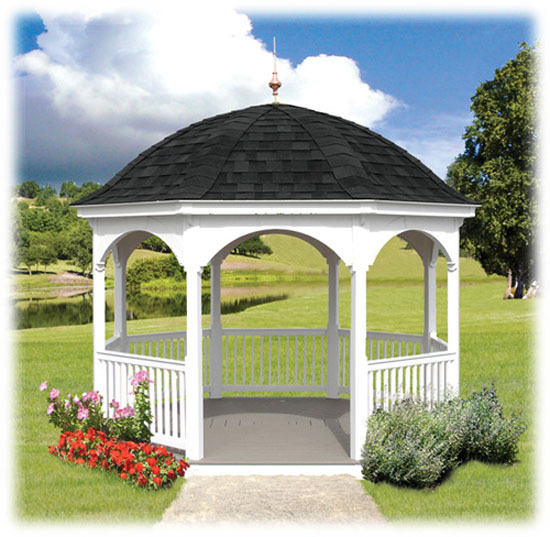 Slightly steeper pitched roof for a more dramatic presence, with cupola. 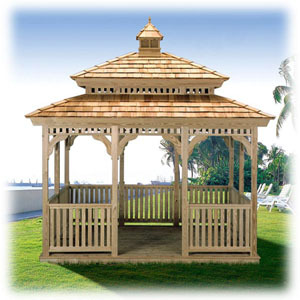 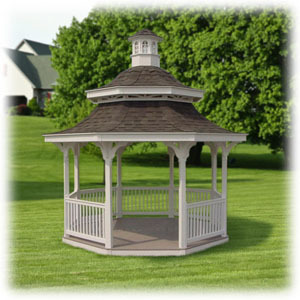 This gazebo will make a stylish statement on your property. 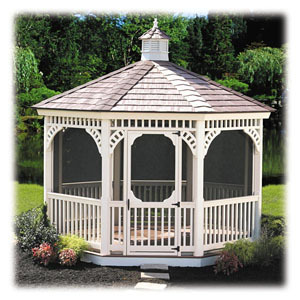 Slightly steeper pitched roof for a more dramatic presence, with cupola, screens and a door. 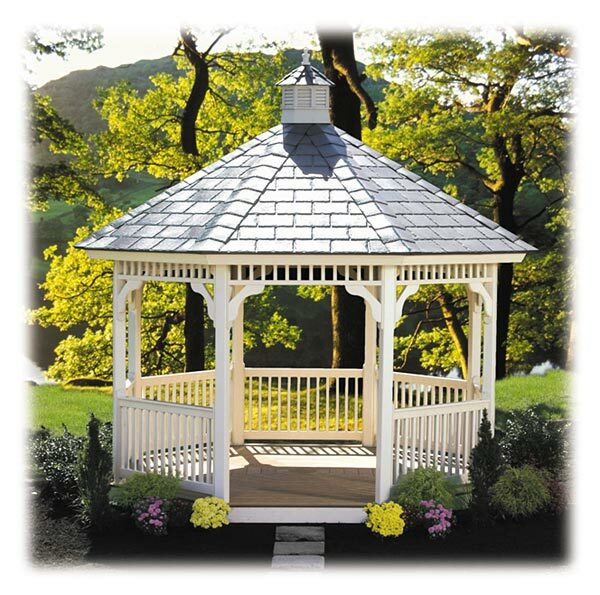 One of our best sellers - simple yet eleganct. 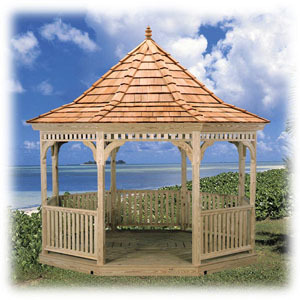 Dramatic reverse curved oriental-inspired roof line makes this design particularly appealing; features filigree corner braces. Octagon Royal with unique double-pitched roof provides a unique and exotic focal point for your personal landscape. Classic simplicity of design and craftsmanship provides timeless visual appeal and adds outdoor living space to your home. Large open sides offer the most direct connection with nature during those delightful spring afternoons. 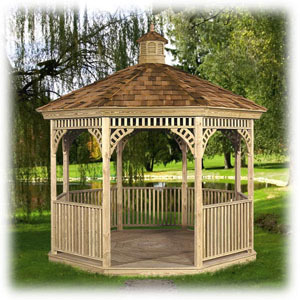 This oval gazebo provides a sumptuous retreat featuring a more rounded floor plan with a welcoming and inviting feeling. 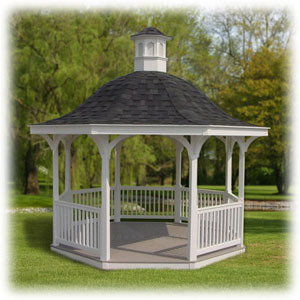 Various sizes are available, including custom dimensions. The most popular choices are 8 x 8, 10 x 10, 10 x 12, and 12 x 12. Breathtaking multi-tiered roofline is a real eye grabber, and will be a constant source of delight. 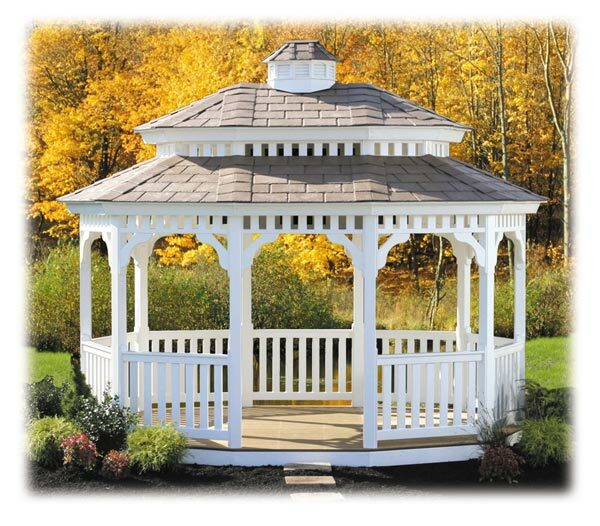 Look carefully to see the subtle upward curve of the double-tiered roofline. 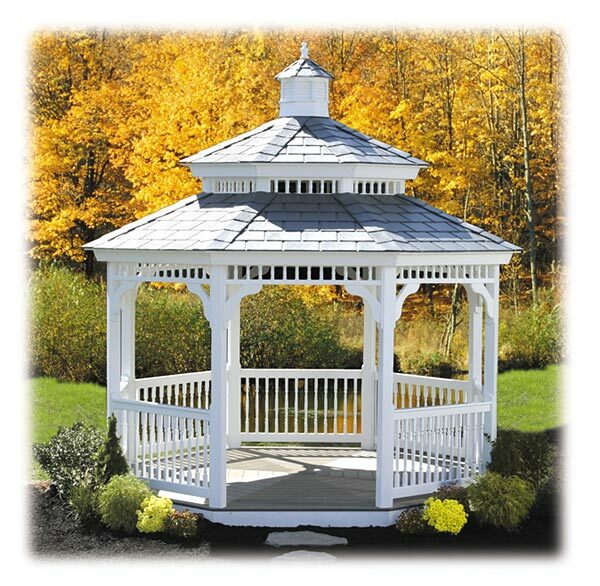 Distinguished design refinement. 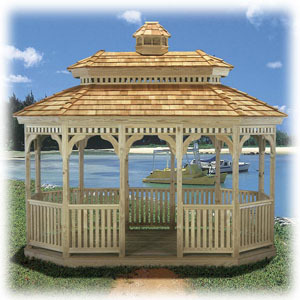 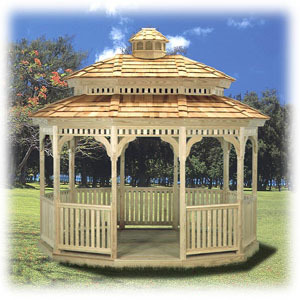 Classic rectangular shape with added "eye candy" of the double-tiered roof with cupola you'll enjoy for years to come. 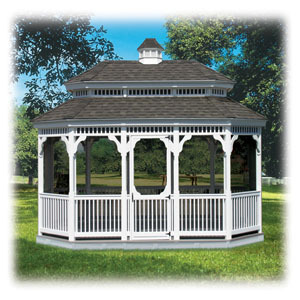 Your family and friends will appreciate this gazebo for its spaciousness; perfect for picnics and gatherings of all types. 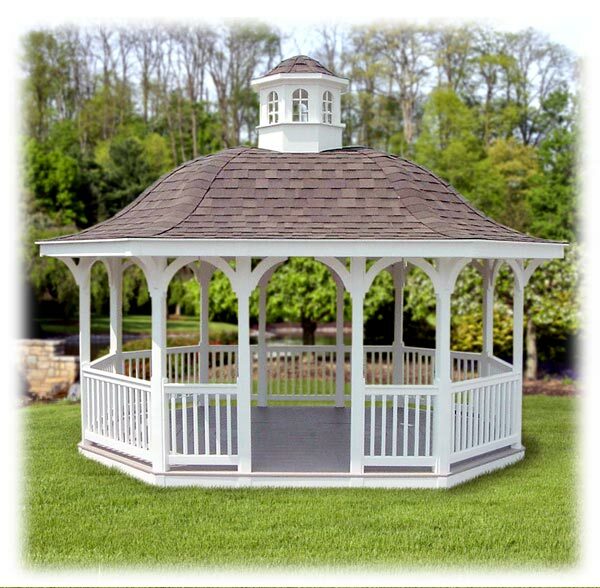 Lots of spaciousness added to our most dramatic triple-tiered roofline. One of our most spectactular gazebos. 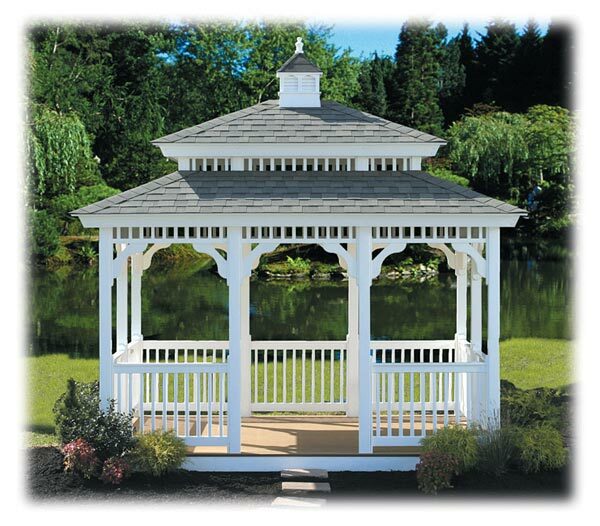 Elegant proportions and details make this spacious gazebo a terrific choice for extra space and eye appeal. 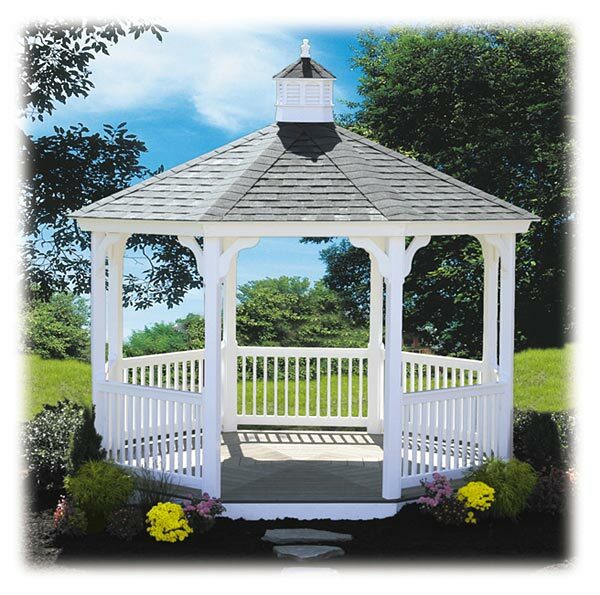 The matching head rail and corner combine for an advanced architectural and highly effective visual effect. 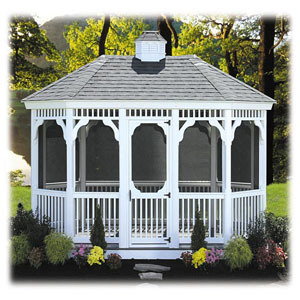 Stunning multi-level roofline combines with classic design proportions to make a dramatic statement. 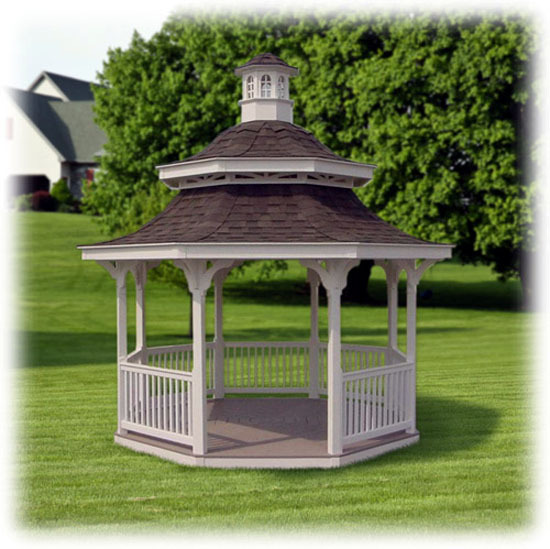 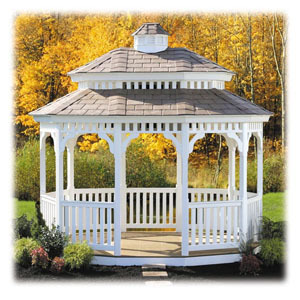 Timeless Vinyl Gazebos have maintenance-free materials in virtually every component. In addition, there are some pleasant choices to make when it comes to styles and colors. 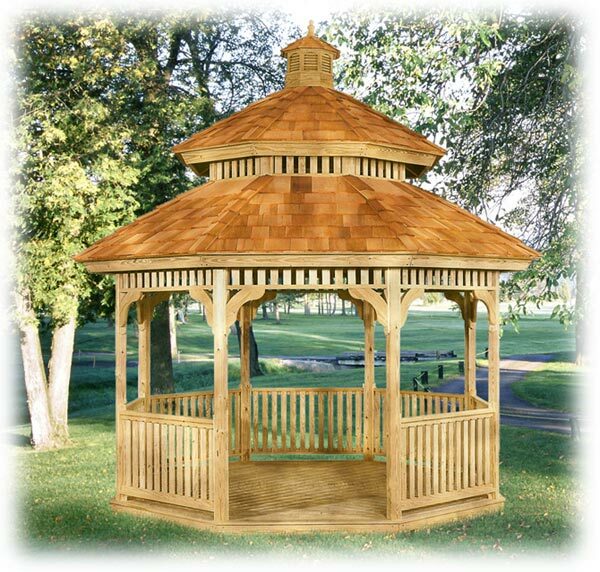 The added roof section that we call the "Pagoda" adds a distinctive profile and provides a little 'something extra' to the traditional Octagon style. 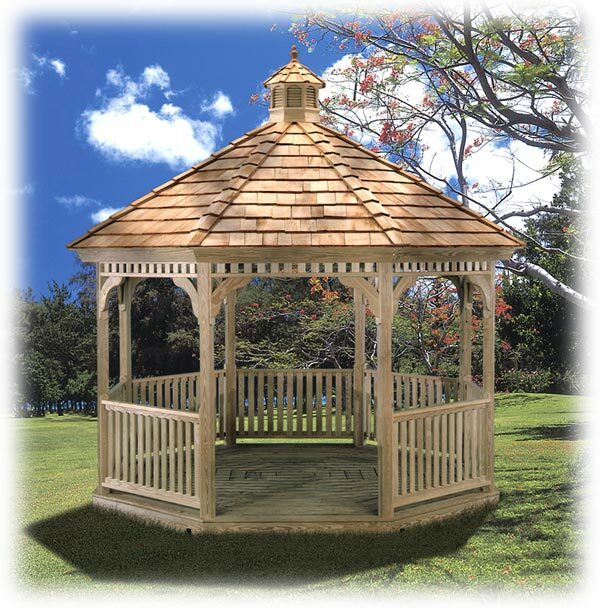 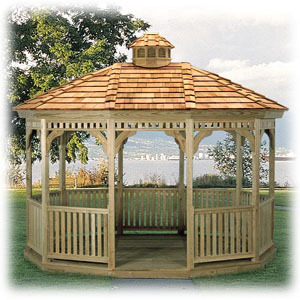 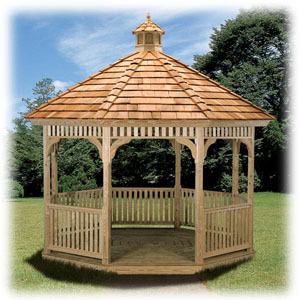 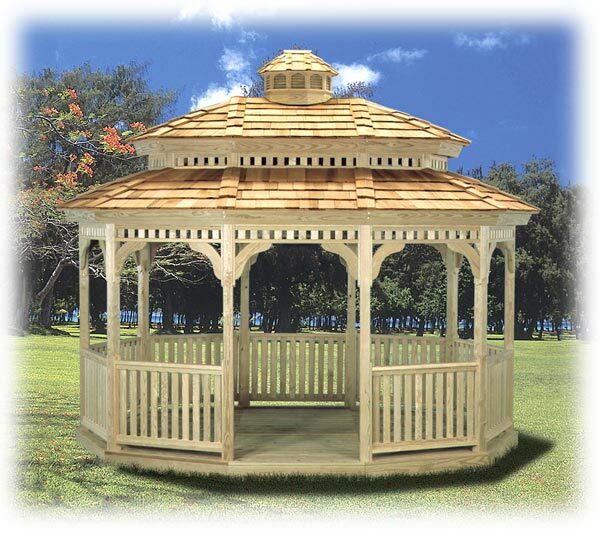 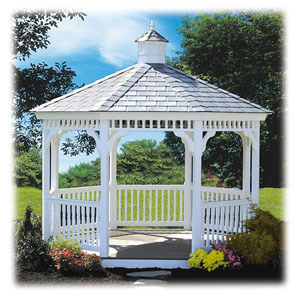 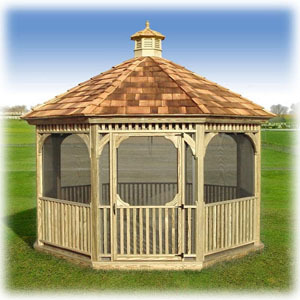 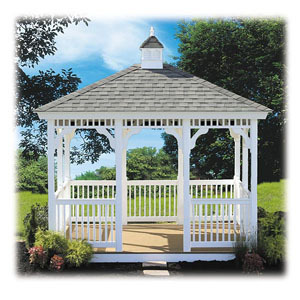 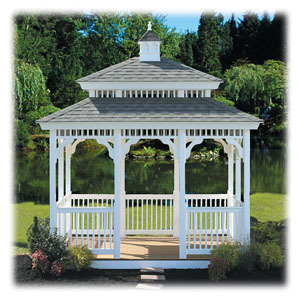 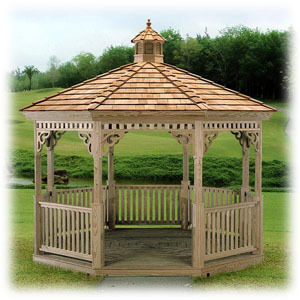 Simple Victorian elements make this a good choice for a classic gazebo on your property. What a great place to enjoy your morning coffee. 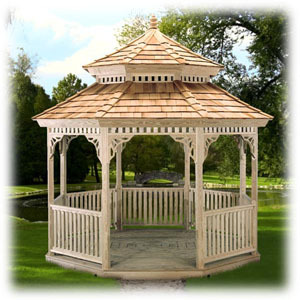 The Octagon Heritage is a classic gazebo form, shown here with screens and door to add more options for your lifestyle enjoyment. 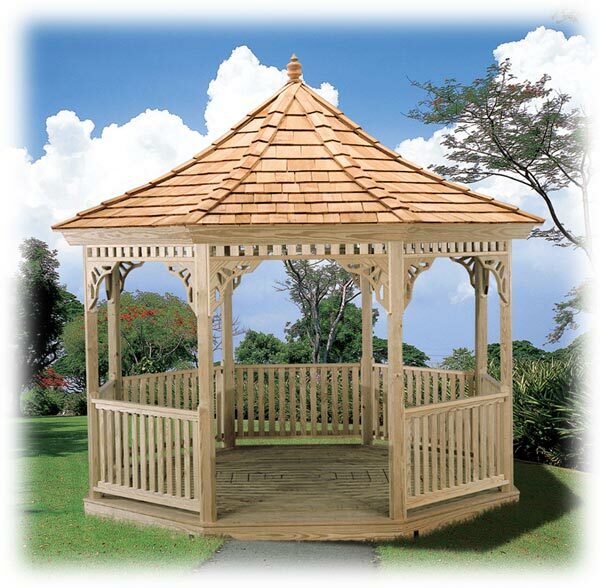 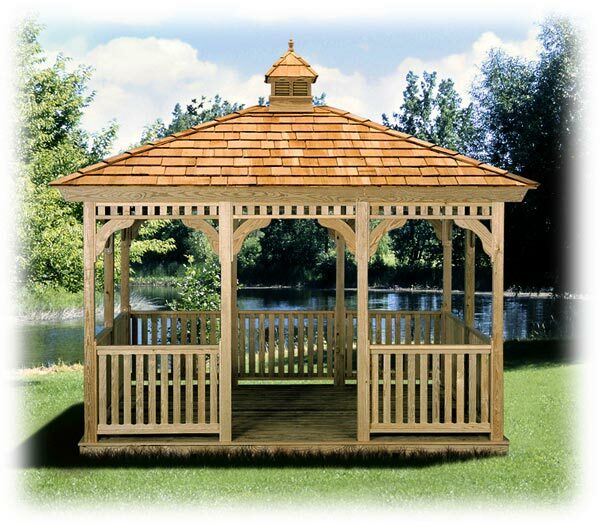 The Octagon Elegant is the entry level maintenance-free gazebo that will add appeal and value to any property. This gazebo offers spaciousness with optional screens and door to add practicality to an enhanced lifestyle. 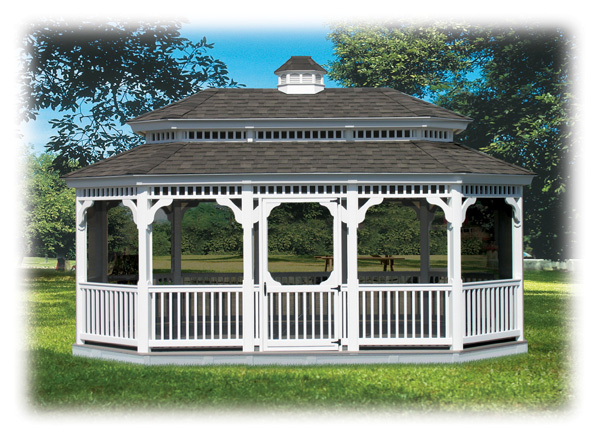 This stretched octagon provides more space for gatherings and parties, or just for stretching out a little more. 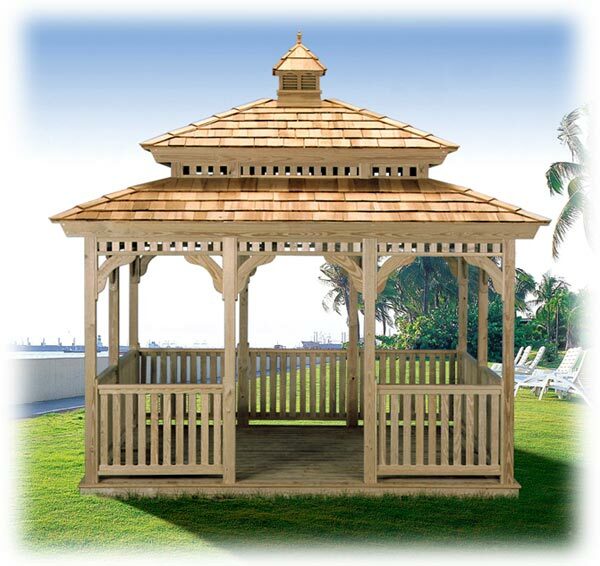 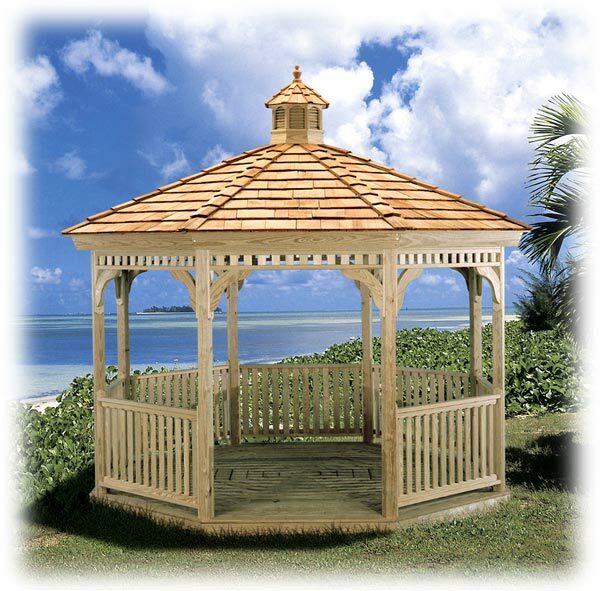 The distinctive pagoda roofline brings allure and added refinement to a Timeless Gazebo. 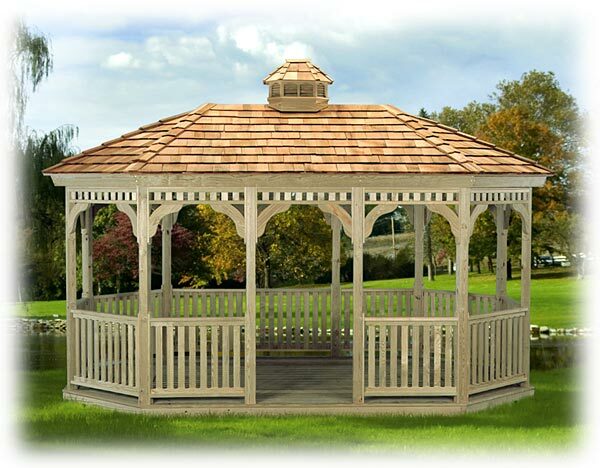 The conventional rectangular floor plan is more spacious than may first appear and is a good choice for outdoor activities. 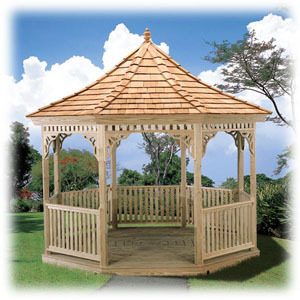 The enchanting Pagoda roof adds an extra dimension of appeal to the simple rectangular shape. 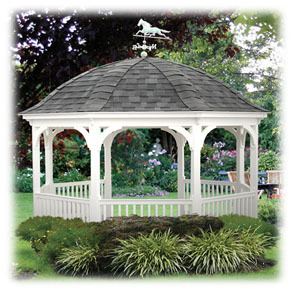 Stylish classic design featuring a bell shaped roof with a cupola. 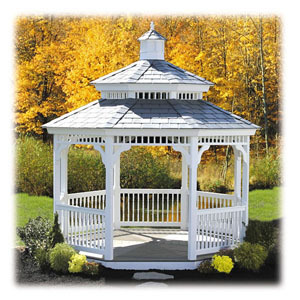 What a great place to sit and listen to the birds. Spacious classic style featuring a bell style roof with a cupola. 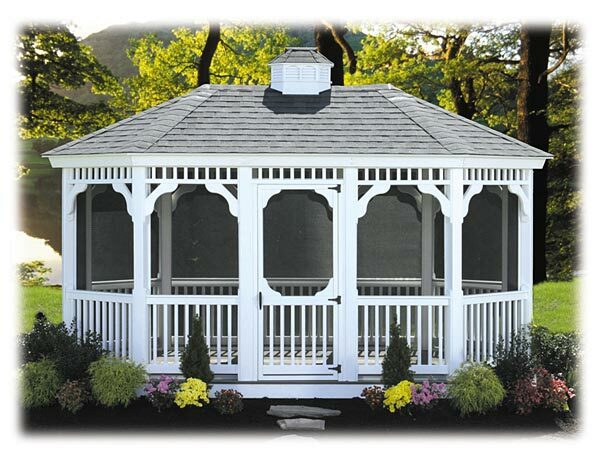 A great way to dress up your back yard. 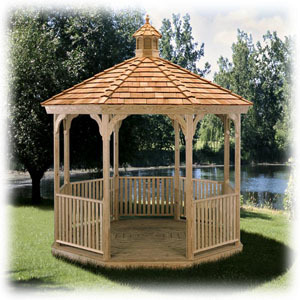 This style gazebo features a dome roof and contemporary design. Very inviting place to sit and chat for hours. 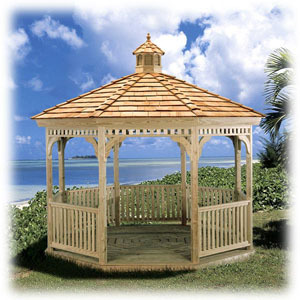 This style gazebo features a dome roof and contemporary design. 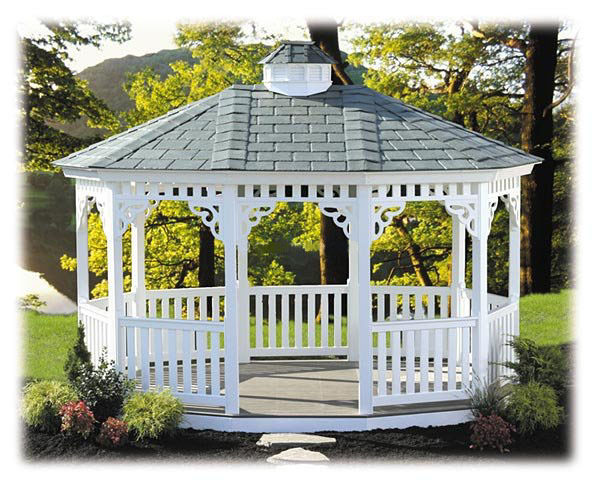 Be the envy of all of your neighbors!